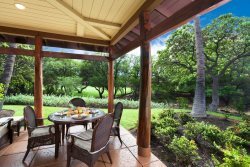 Sense of tranquility and escape is total at Waikoloa Beach Resort Villa that features two bedrooms, two full bathrooms and accommodates up to six guests. Cool off in one of the two community swimming pools and in the evening, enjoy a soak under the stars in the outdoor hot tub. From the front porch, guests enter the home where there is a warm, inviting living room, with a cozy designer sofa and chairs surrounding a large flat screen TV. Beyond the living room, there is a kitchen and dining room. The well-equipped kitchen is made for entertaining, and offers high-end appliances, a large breakfast bar with three barstools, a breakfast nook with seats for four and the dining table seats six. Just off the living area there is a private covered dining lanai that features a built-in BBQ grill, dining table with seats for four, and amazing views of the golf course and lake. The master suite features a cozy king-size bed, flat screen TV and an attached bathroom with a separate walk-in shower and a deep soaking bathtub. The guest bedroom features two twins, flat screen TV and the main bathroom is close in proximity. Extra guests will enjoy the comfort of a queen-size sleeper sofa. Also included is a full-sized washer/dryer, air conditioning and ceiling fans, ice chest, boogie and kick boards, beach chairs, beach towels, and complementary parking and complimentary WIFI. There are two swimming pools, two hot tubs, and a fitness center. Too tired to cook or looking for a night out, there is also dining at the Kings and Queens’ Marketplaces adjacent to the property where you can enjoy fine dining, local fare, and take out/fast food. All units have a well-thought-out guidebook to the local area, complete with sections describing Waikoloa Beach Resort and all its offerings, important phone numbers, Big Island life information, a guide to beaches, shopping, activities, Luau/Dining, and Golf.